TH E M R EP O RT | 31 COMPANY SPOTLIGHT KEY PERSONNEL Jerry Mavellia CEO Dan Leader COO Greg Matecki CFO Ernie Stefkovic Director of Strategic Initiatives STAFFING 65 employees CONTACT INFORMATION Dan Leader, COO 215.354.6675 drl@guardianassetmgt.com 2021 Hartel St. Levittown, PA 19057 Website: GuardianAssetMgt.com GUARDIAN ASSET MANAGEMENT COMPANY DESCRIPTION Founded in 2007, Guardian provides property preservation, inspection services, FHA conveyance inspections and conveyance repairs, hazard claim repairs, REO management, and general contracting services for government agencies, banks, GSEs, mortgage servicers, hedge funds, asset management companies, REIT, and the resort industry. 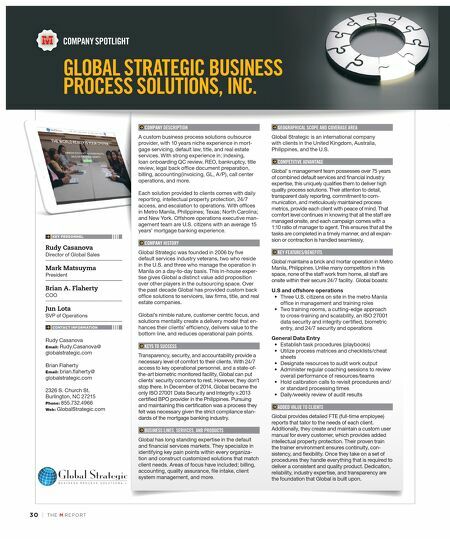 Guardian is an SBA certified HUBZone and 8(m), minority and woman-owned business. Guardian holds government field maintenance contracts with the Army Corps of Engineers and the National Park Service. Guardian has key personnel with over 25 years' default and REO management experience. As FHA conveyance specialists, the team has managed standing inventory levels of more than 60,000 properties and has managed and sold more than 500,000 REO properties. Guardian utilizes Aspen Grove, a cutting edge property management platform with a fully integrated mobile device that seamlessly integrates inspection, preservation and conveyance results in real time. Guardian and its key personnel have had a top-rated quality service record for 20 years with HUD, Fannie Mae, GMAC, FDIC, GSA, Army Corps of Engineers, and the National Park Service. COMPETITIVE ADVANTAGE • Facilitate conveyance and claims repairs simultaneously • Services both forward and reverse mortgages • In-house QC and vendor training teams • Mobile application and dispatch board with real time status ADDED VALUE TO CLIENTS • Offers onsite client service mangers • Nationwide "boots-on-the-ground" coverage • Total asset and service transparency through technology • HOA, condo, utility, and vacant property registration services Guardian Asset Management is compliant with reporting inspection and preservation results in MISMO standards. This allows their clients to reduce costs and have an increased transparency and accuracy regarding asset status and preservation conditions. KEYS TO SUCCESS • Dedicated work teams by project or client • Fully transparent real-time data reporting with dashboards • Direct vendor network and work team score- carding • Vendor retention, including service bundling, routing software, field supply discounts, and in-house field training INDUSTRY AWARDS, ACCOLADES, AND MILESTONES Guardian is an SBA certified HUBZone and 8(m), minority and woman-owned national property preservation and inspection company. 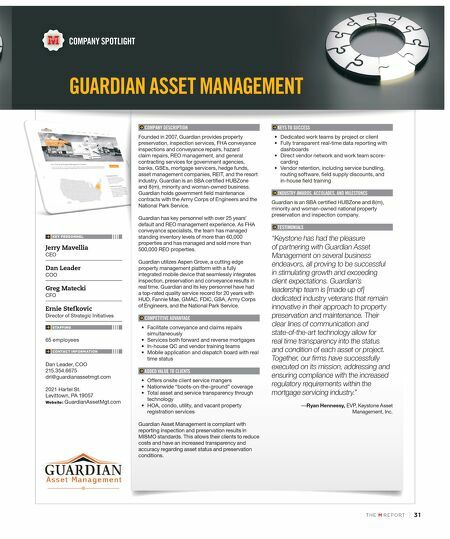 TESTIMONIALS "Keystone has had the pleasure of partnering with Guardian Asset Management on several business endeavors, all proving to be successful in stimulating growth and exceeding client expectations. Guardian's leadership team is [made up of] dedicated industry veterans that remain innovative in their approach to property preservation and maintenance. Their clear lines of communication and state-of-the-art technology allow for real time transparency into the status and condition of each asset or project. Together, our firms have successfully executed on its mission, addressing and ensuring compliance with the increased regulatory requirements within the mortgage servicing industry." —Ryan Hennessy, EVP, Keystone Asset Management, Inc.